I love the name of these socks. For many years in elementary school I would only take PB&J sandwiches. My mother said I was adamant about nothing else. Probably had a lot to do with the amazing array of homemade jam that I had to choose from to put on those sandwiches. 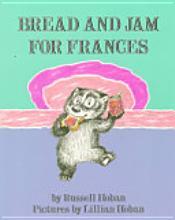 I even received the book Bread and Jam for Frances as a gift one year. I remember it well, as we owned very few books, using the Public Library instead. I still have a fond affection for that particular sandwich, so was tickled when this pattern came as a club selection with this name. The color of the yarn is gorgeous also, very reminiscent of a berry jam. 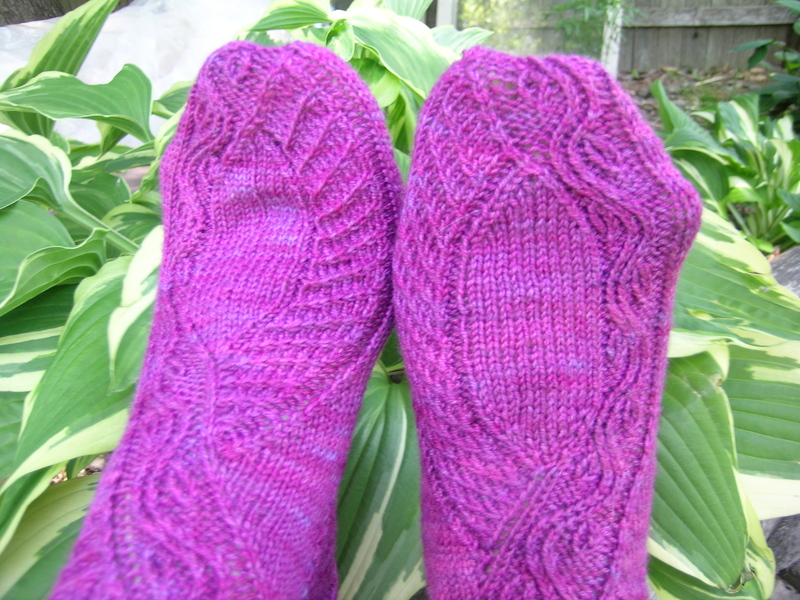 I finally finished these socks on our little trip. They have been washed, and are being reserved for me, as nobody else would give the proper acknowledgement of how much time went into them each time that they were put on. They did take quite awhile to finish. I ended up making the small size, for my 9 1/2 sized foot, which is really crazy. The test knitter must have been an extremely tight knitter. 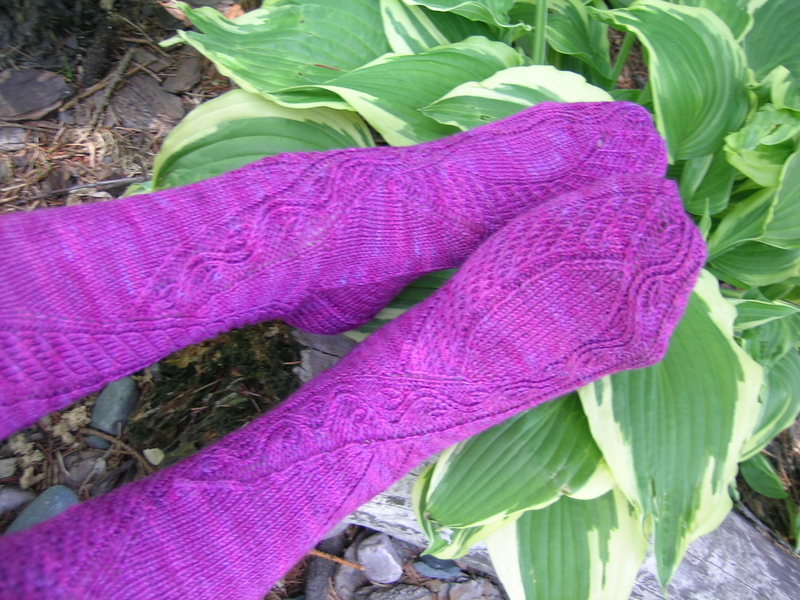 Her gauge does not match that of any of the other socks in the CookieA books. I had no interest in trying all of these cables on size 0 needles, and bending them in the process. 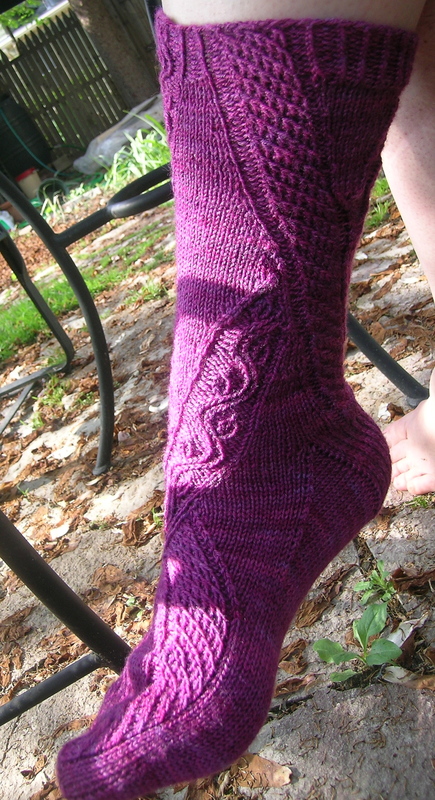 T he color is much more accurate in this photo, also shows the meandering cables along the side of the sock. Now, off to the Farmer’s Market to get some Rhubarb, Raspberries and Strawberries. It is jam making weekend.